Employee on job training - Importance and advantage of on job training. Home » Human Resource » On job training » Employee on job training – Importance and advantage of on job training. Employee on job training performs to implementation of effective quality and smooth functions by adopting process management to all employees. Managing On Job training – Department head involvement. Actually, Management of all the individual employee on-job training and its development, and arrange of training is conduct by HR department. Generally, HR Manager is responsible for monitoring and manage overall training of all personnel in consultation with concern head of department. Each process owners is responsible for defining the competency Norms for each activity and monitoring the existing competence level of the personnel / effectiveness of the training. Concerned head of department is responsible for arranging the training program for department process owners. Plant Head is responsible for identifying training need of department head of department. Specific responsibility is given in the description. Technical Qualification, Knowledge of Company Management System & Applicable Statutory & regulatory Requirement, Good Communication Skills, Leadership Ability, Computer Literacy, Convincing Ability, Man Management Skills, Administration Skills. Perform Gap Analysis of employees based on the Decided “Competency Criteria”. Identify the Individual training needs of employees from department by concerned head of departments on the basis of Gap Analysis. Or Organization requirement and communicate to head of department. Receive the training needs of department head of departments, identified by Plant Head. Compile the data of identified training needs and prepare a Training Calendar for the Year mentioning Monthly Programs. Obtain approval on Training Plan by the management. Arrange / organize the training as per Training Calendar in consultation with Concerned HOD either through External Agency or Internal Agency and arrange release of the employees for the training. Arrange training in consultation with Concerned HOD’s and with identified faculty. Obtain “Feedback of training” from participants and analyze the feedback for future reference. Receive “Effectiveness of training” taken by participants, from concerned head of department’s on “Feed Back & Effectiveness of Training” format and maintain the records and if required, arrange retraining of the employee. 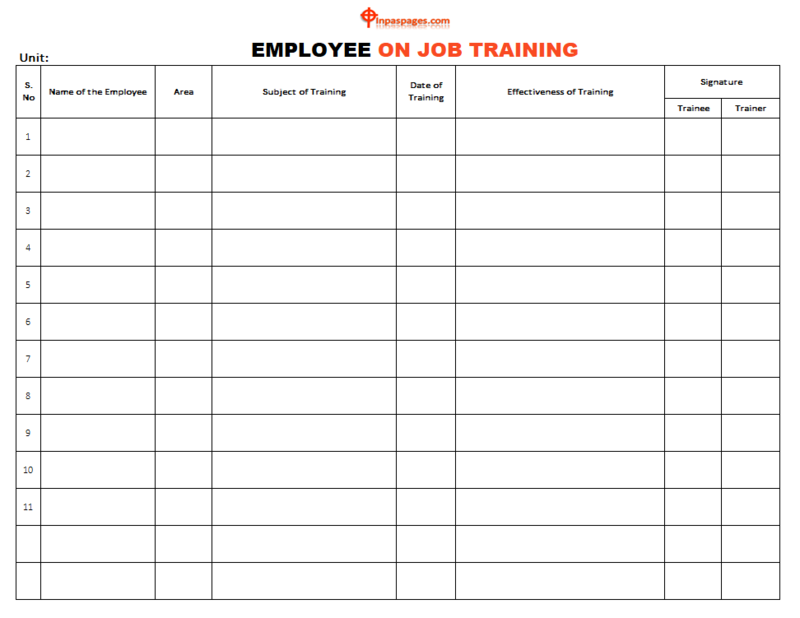 Maintain the individual Training records of the employee. Prepare a report based on the feedback received from head of departments’ and participants and submit the same in Management Review meeting through management representative.